Inflight magazines are a common sight whenever you fly, but the Russian Railways also have give their passengers something to read on long train journeys – inhouse magazine «Саквояж СВ». «Саквояж» is the Russian word for a leather travel bag – an related to what in the west is called a ‘carpet bag‘. The «ЖД Медиа» (Railway Media) describes the magazine as such. “Саквояж СВ” is the first in the country ground-based full-color full-fledged on-board magazine, distributed on the trains of OJSC “RZD”. 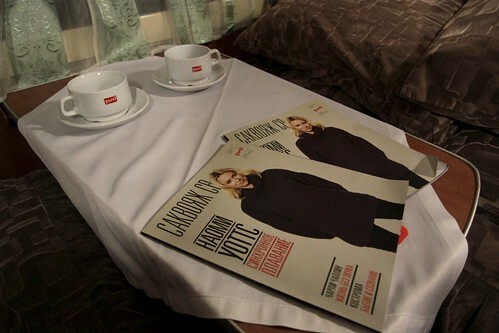 Magazine Саквояж СВ is distributed in all first class carriages (individual copies for each passenger), as well as sleeping cars (one copy per table) of RZD long-distance trains. It is a bright monthly publication in the style of life-style and covers all aspects of life. The magazine allows you to waste time traveling and find useful information for passengers. Author’s columns set the style for the whole magazine. Leading Russian and foreign journalists share their thoughts with the readers about the most important issues of the present. Famous music journalists, film critics, and also commentators of the world of engineering and automotive industry talk about the latest releases and novelties. Stories about the most famous railway stations and stations, detailed guides to cities and countries. Qualitative photo-reports about life in Russia and abroad. The life path of famous people with all the turns, ups and downs. Stories about compatriots who succeeded abroad. Collections of citations of celebrities of the past. Everything is new from the world of science and technology. Anything that will seriously change our life in the future and changed it in the past. Actual characters of our time – filmmakers, actors, musicians, writers and politicians – talk with correspondents of the magazine “Саквояж СВ”. Stories of famous writers, written specifically for the magazine “Саквояж СВ”. The Russian Railways also publishes ‘Sapsan’ magazine – “The official journal of the Sapsan high speed train”. This entry was posted in Trains and tagged magazines, media, Russia, Russian Railways. Bookmark the permalink.